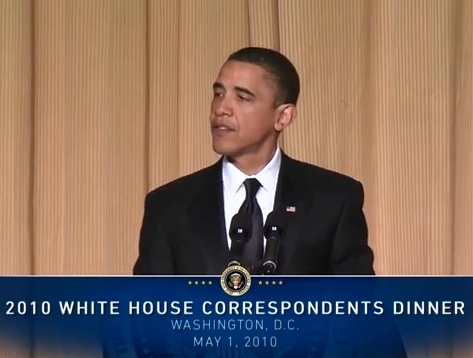 It now makes total sense why so many liberal media members thought President Obama killed at Saturday's White House Correspondents' Dinner. Writers from the "Daily Show" helped craft the jokes. Such was reported Sunday by the Daily Beast's Lloyd Grove. Obama-aided (as presidential political guru David Axelrod acknowledged to me when the show was over) by the razor-sharp jokesters from The Daily Show-came armed with fresh and funny material that prompted some of the biggest laughs I've witnessed the Leader of the Free World receiving in more than two decades of attending this strange Washington media-political celebration of self-congratulation-a tribal (and, to outside observers, potentially unappealing) rite of spring in which supposedly discerning and skeptical journalists laugh their posteriors off and lavishly kiss the one belonging to the Comedian-in-Chief. Even correcting for an undoubtedly unfair comedy advantage (in which any joke uttered by any president is automatically five notches funnier than the same one that slipped off the tongue of a mere mortal), Obama is a natural entertainer who has, among all the other things he has been doing in the past year, sharpened his comic timing and delivery. Makes you wonder if Grove asked for the President's autograph.